When Edmund Sexton Pery and his family built Newtown Pery as the new town for Limerick from 1765 on, part of their plans included building stone corn stores within the grid of the new town. 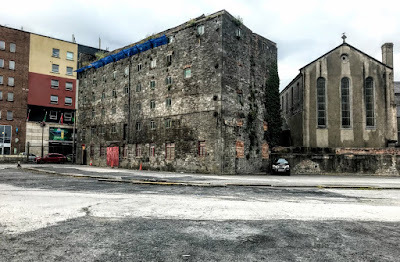 Many of these corn stores and large mill buildings were concentrated in the area near the River Shannon, they often faced the rivers where the quays had been built, and there was another concentration of mill buildings on the east end of the new town. These stone corn stores were generally built of uncoursed limestone rubble with small, brick-formed arched windows and timber loading doors. Some are set in large courtyards, others were built adjacent to terraces, and others could be found within the grid of the new town. Two interesting examples of these corn stores and two of the largest to survive to these days are the large, six-storey building on Robert Street, close to Saint Michael’s Church on Denmark Street, and the former Newsom’s building nearby on Denmark Street. Nearby landmarks include Saint Michael’s Church, Smith’s Bar and Nightclub, and Flannery’s Bar. 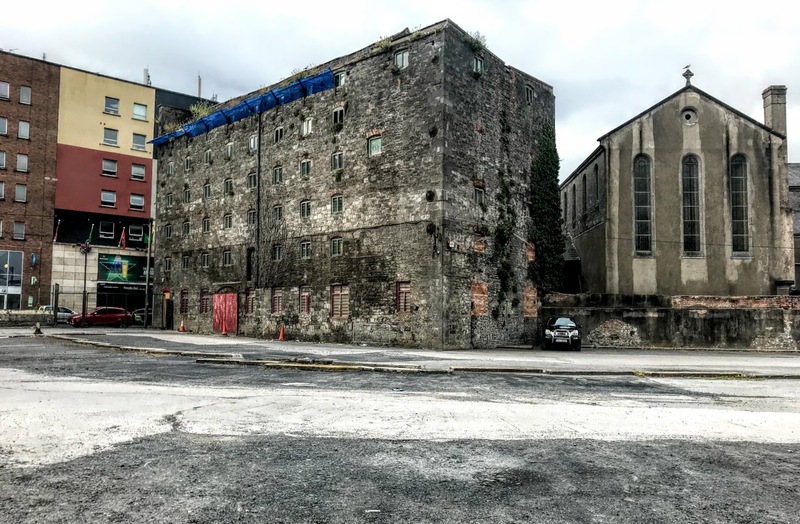 The former corn store on Robert Street is an imposing limestone warehouse, and – with its heavy massing and large scale – it maintains a link with the economic and industrial past of this part of Limerick. Today it stands in a large open area in the city centre that is used as a car park. 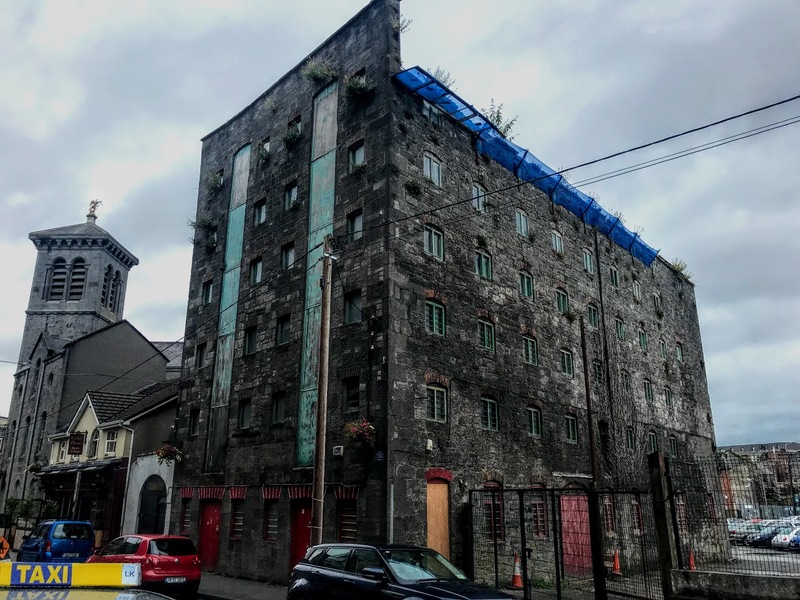 This six-bay, six-storey warehouse was built around 1800 with random coursed stone. Facing south, it has two hoist bays on the front facing Robert Street and nine-bay side elevations. The building has squared and tooled random coursed limestone walls with random rubble limestone on the other elevations. There are cast-iron wall tie plates, squared quoins all the corners, and gauged red brick flat-arched window openings with fixed-pane timber windows. The camber-headed red-brick arch loophole openings have been boarded up. There are voussoirs in the stone flat-arched openings at the ground-floor level, with timber windows and two door openings with double-leaf timber doors. At the sides, there are gauged red brick segmental-headed window openings with square-headed bipartite timber windows. The M-profile natural slate roof has gables hidden behind the high parapet wall with stone coping. The building has Metal and plastic rainwater goods. Inside the building, the open floors were supported by timber posts and beams. More recently, this former corn store was in use as a gallery and home to Limerick Printmakers. However, they have since moved to Saint John’s Square, and the building is now locked and appears to be vacant. Although it faces Robert Street, it is best viewed from Ellen Street when there are few cars in the car park beside the former corn store. Close by, at 20 Upper Denmark Street, the former Newsom’s building is next door to Nancy Blake’s, a landmark pub at No 19. 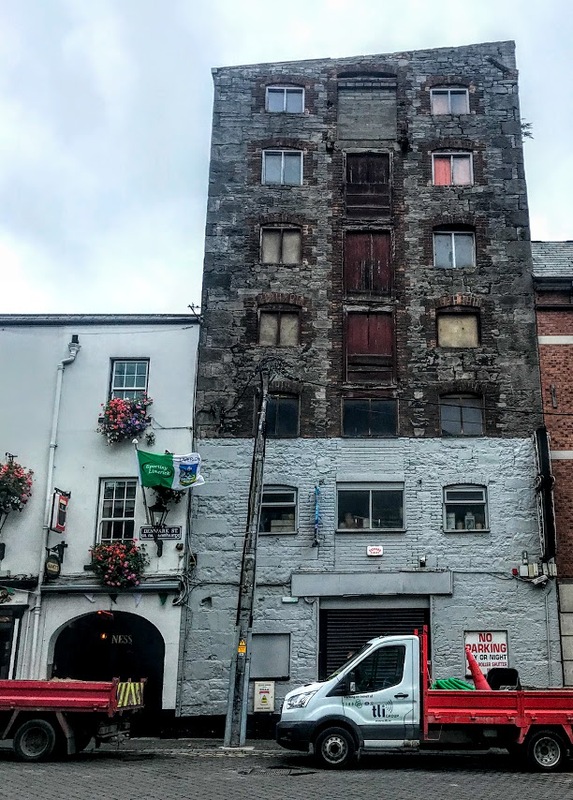 This three-bay, seven-storey former corn warehouse was also built round 1800, and a central hoist opening rises the full-height of the front of the building above the ground floor level. A single-pitched replacement roof was added around 1960, resulting in the front elevation being cropped at eaves level. The random rubble limestone walls have a red-brick eaves course, and there are squared quoins at the corners. A central camber-arched brick-framed loophole has been blocked up at the sixth-floor level. There are tongued and grooved timber-panelled doors at the third, fourth and fifth floor levels, and modern windows at the first and second floor level. There are segmental-arched window openings throughout the building, with red brick arches and reveals and timber casement windows. This substantial former stone corn store remains relatively intact, despite the loss of the original roof structure. Along with other its companion building on Robert Street and other surviving industrial buildings in the area, it stands as a testimony to Limerick’s industrial and economic past.